Actalin™ is an all-natural premium dietary supplement formulated by renowned holistic physician David Brownstein, M.D. 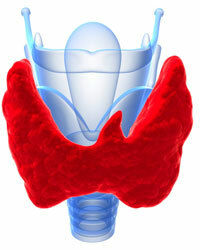 to support your optimal thyroid health. This formula contains a strategic blend of 17 nutrients, including iodine, adrenal glandular powder, L-tyrosine, methylsulfonylmethane (MSM), and additional vitamins and minerals. Plus, you’ll also find health-boosting herbal nutrients such as ashwagandha root extract, forskohlii root extract, and guggul gum resin extract. Have you ever heard of the "butterfly effect"? In advanced math theory, the butterfly effect describes how a tiny influence on one part of a system can have a tremendous impact on another part. The butterfly effect suggests that a tiny butterfly fluttering its wings in, let's say, a jungle somewhere in South America . . .
Could actually initiate a storm — even a hurricane — off the coast of Florida, for example. So what does the butterfly effect have to do with you — or your health — for that matter? Well, in the next few minutes, you'll read about a tiny cluster of body tissue with a tremendous impact on your overall health. In fact, in this report, you'll see how this small gland can exert a butterfly-type effect on nearly every part of your body. You'll see how it could very well be the hidden culprit behind your flagging energy, your moodiness, perhaps even that 'blah' feeling that makes it difficult for you to just get out of bed some mornings. And best of all, you'll discover how easily you can wake up feeling peppy, more emotionally balanced, and more energetic once again, ready to take on all of life's challenges . . . So make sure you read this report in its entirety, because it contains potentially life-changing information you won't find anyplace else. Now the truth is, while mathematicians haven't extended the concept of the butterfly effect to your body . . .
You carry your very own 'butterfly' around with you all the time. What's worse, many of those suffering from concerns related to their little pink butterfly don't even know it. Of course, they don't have the knowledge you'll gain from this report. And while thyroid concerns are often considered a “woman's issue”, they actually affect both sexes, and particularly those middle-aged and older. After mentioning Dr. Brownstein, you may be wondering who he is — and why you should listen to him . . .
Well, David Brownstein, M.D. is a board-certified family physician, and Medical Director of the Center for Holistic Medicine in West Bloomfield, Michigan. Dr. Brownstein is the author of 11 health books to date, and a sought-after guest lecturer. He's also medical editor of the popular Newsmax newsletter Dr. Brownstein's Natural Way to Health. While Dr. Brownstein started out as most M.D. 's do, with the conventional medical model, he quickly realized its shortcomings. And just to let you in on a little insider secret, his very first thyroid patient was actually his own father, Ellis. Researching and solving his father's thyroid concern put Dr. Brownstein on a 25-year quest to learn everything he could about the importance of the thyroid to your overall health. With everything he's learned along the way, and after seeing thousands of patients, Dr. Brownstein has become one of America's foremost authorities on thyroid health. He's even written books about the thyroid, and about the importance of iodine to the thyroid and overall health. So now that you know more about Dr. Brownstein, let's get back to this report . . .
For millions of Americans, that sluggish feeling is a direct result of a thyroid gland not functioning at an optimal level. Feeling so pooped out makes it difficult for you to perform well at work or recreation. However, keep reading . . .
Because you'll see shortly why you can't trust the results of a commonly used thyroid lab test — a test many doctors use that often overlooks sub-optimal thyroid function issues. So even if you hear from a doctor that your thyroid is 'fine',Dr. Brownstein has some advice you'll want to stick around and hear — just to protect yourself . . . But just keep reading, you'll hear from Dr. Brownstein himself about how an inadequate level of iodine is much more common than conventional medicine believes. Dr. Brownstein will also give you some practical tips about what you can do, simply and easily, to boost your thyroid health yourself. But first, let's return to the 70's . . .
You remember — disco, plaid bellbottom pants, and Bonanza. Something else happened during that decade, something impacting millions of folks and their thyroid glands to this day. In the 1970's, the thyroid stimulating hormone test (or TSH test) was developed. This test was considered an advancement in medicine. Unfortunately, according to Dr. Brownstein, many doctors began to use it as the sole measure of thyroid function. And as Dr. Brownstein points out, no one test tells the whole story. He has seen many people with “normal” results on the TSH test who suffer with thyroid concerns. 1. Make sure your doctor runs a full thyroid panel, not just an isolated TSH test. 2. If you see your TSH increasing over time, don't wait for thyroid concerns to develop. If your doctor doesn't want to work with you, find one that understands how to properly interpret thyroid tests. A holistic healthcare practitioner will usually be more knowledgeable about this. With so many issues related to your small pink butterfly, I'm glad we could get Dr. Brownstein to offer you some of his expertise when it comes to your thyroid health. If you've read to this point, I know you're convinced that optimal thyroid function is crucial to your overall health. So please claim this opportunity right now, while you're thinking about it. And remember — you get 17 targeted nutrients in just one doctor-developed formula — nutrients to support your healthy thyroid function. Just imagine not having to give your little pink butterfly a second thought again . . . Imagine not feeling so tired, grouchy, or out of sorts . . . and instead, waking up ready and eager to attack your to-do list . . . P.S. : In addition to a healthy diet and exercise, Actalin™ could well be what you need to stop feeling tired, moody, or 'not quite right'. Plus, your satisfaction is guaranteed. Actalin™is a specially formulated all-natural dietary supplement containing 17 hand-picked ingredients. All these proven ingredients have been individually selected to help support thyroid function, immune health, energy metabolism, and adrenal health. Iodine is critical for production of adequate thyroid hormones. In fact, you need three iodine molecules to produce the T3 hormone and four iodine molecules to produce the T4 thyroid hormone. T3 and T4 are the two key hormones produced by the thyroid gland. Ashwagandha is considered an adaptogen, an herb that normalizes body physiology, particularly when disturbed by stress. Journals in modern time, animal studies documented in the Journal of Pharmacy and Pharmacology and the Journal of Ethnopharmacology demonstrate the Ashwagandha may provide support for thyroid function. L-thyrosine is an amino acid and protein building block your body requires in order to produce not only thyroid hormone, but also other hormones such as noradrenaline and dopamine. In fact, without tyrosine, you would have no thyroid hormone function. That’s because tyrosine is the central molecule of thyroid hormone, with four iodine molecules attached to on tyrosine to make thyroxine or T4, and three iodine molecules attached to make thyronine or T3. Periodic TableZinc is also needed to support the conversion of T4 to the more active T3 hormone, so insufficient zinc can prevent your thyroid from making enough active thyroid hormone. Sufficient quantities of vitamin D within body cells are required for the thyroid hormone to function properly. Plus, vitamin D helps convert T4 to T3 and is needed for thyroid hormone production in the pituitary gland. "I brought this for my wife, She tried it for few weeks now, and now her hairs stopped falling out, she feels much better, than the one she had been taking from Doctor. Will continue to buy this products. Awesome Job Dr. Brownstein! My wife is very happy about it." "I am a 48 year old woman who has struggled with weight and blood sugar and high blood pressure issues for more than 20 years. I got on the BIG PHARMA cycle of drugs and felt even worse. I stopped the meds and have been trying to use natural ways and I have been following Dr. Brownstein for almost a year, and it was his information about iodine deficiency and all the symptoms it causes that led me to try the Actalin. My life has changed. My blood pressure is under control without meds, my sugar numbers are currently in the 150's, which is lower than I could get when I was on the meds. Even watching my food intake my weight stayed, it didn't matter what I did, but I am now down 25 pounds. I have more energy now than I did when I was in my 30's. Not only has Actalin changed my life, it has saved it. I am actually looking forward to going in for my yearly physical with my doctor!" "I ORDERED ACTALIN FOR MY WIFE BECAUSE HER PRESCRIPTION FOR TYROID WAS NOT DOING ANYTHING FOR HER CONDITION. AFTER THREE DAYS OF USE, SHE IS LIKE A NEW PERSON, SHE SAYS IT IS THE BEST MEDICINE SHE HAS EVER TAKEN. THANKS VERY MUCH!" "Since we take ACTALIN I have less hotflash, I feel less tireness, we feel better and better, 3 adults take Actalin and feel, I am grateful for ACTALIN!"